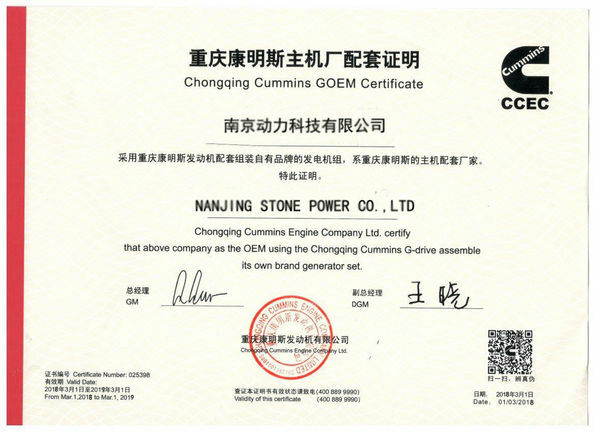 Stone Power is belong to Yinpeng Group,one of the biggest industrial/marine diesel generator set and marine engine supplier in China,located in Nanjing,China,which is the flourishing area of the world manufacturing,one of the largest manufacturing bases of diesel generater set in China,covering an area of 35,000㎡ and with a 10,000㎡ assembly workshop. StonePower is specilized in designing and manufacturing multi-cyclinder and multi-series industrial diesel generator sets, water pump units and relevant equipments for a variety of application ,such as telecommunication system, data center, mining, electric power, harbor equipment , engineering companies, financial systems, hotels, railways, airports,commercial buildings, hospitals, factories and etc. StonePower adopts internationally and domestically reputed high-uality engines and alternators including Cummins,Perkins Deutz,Mitsubishi,Lovol,YTO,Ricardo for our industrial diesel generator sets, with power range from 20kW to 1500kW and various types of design. 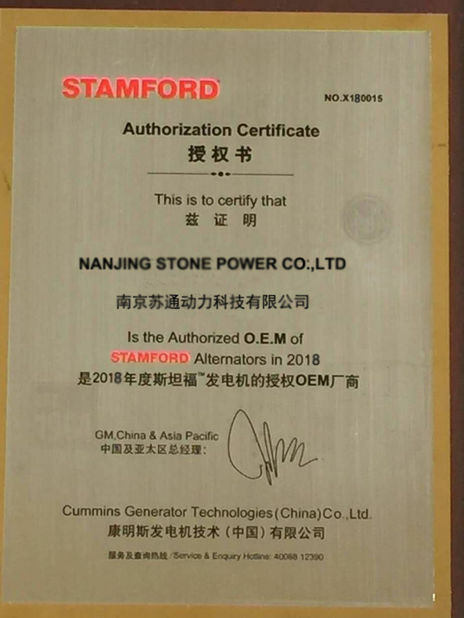 With the compelling quality and service,StonePowerhas built a good reputation with customers in the line of generator sets, our products are exported to morethan 30 countries including Europe, Americas ,Middle East, Africa, Asia and other regions. We dedicate to make this work place safe and efficient. we are proud of our management team and employees who have best quality and deep experience in the industry. Stone Power is dedicating to establishing good relationship with customers through closed cooperation and integrity. It has been constantly cooperating with excellent international and domestic enterprises to utilize the best resources to bring Stone Power to cultivate an international brand. Stonepower Generators Co., Ltd is manufacturer who Focus on generator sets( on-site, house, commercial, removable) and related products . From 8KVA-2475KVA (6.4KW-1980KW) , Stonepower brand Gen-set are powered by world famous engines Cummins(20kw-1240kw), Perkins(7kw-200kw), Deutz (24kw-1600kw), Misubishi(540kw-1800kw )and Lovol(23KW-461KW). Diesel engines coupled to Newage Stamford alternators, Marathon Alternators, Mecc alte alternators and Topower AC alternator, The Gen-set categories include 50HZ、60HZ,1 phase, 3 phases, open, soundproof and removable types. ★ Guarantee to respond customers' requirement within 24 hours and solve clients' problem within the shortest period of time. ★ On the basis of in-house service network, service resources from global partners could be shared to ensure international warranty service. ★ Established spare parts management system and with automatic storage to satisfy clients' demand on spare parts. ★ Services for remote monitor, diagnosis and maintenance. ★ According to customer's requirement, we are able to establish service center at project site to provide service around the clock. A: It’s 1 year or 1000 running hours whichever comes first. But based on some special project, we can extend our warranty period. Q: Does your generator have global warranty? A: Yes, all of our products like Cummins, Perkins, Misubishi power generator enjoy the global warranty service. And the alternators we use like Leroysomer, Stamford, marathon also enjoy the global warranty service, so you do not need to worry about the aftersales service. A: Yes, we can accept OEM. A: We can accept T/T 30% in advance, 70% balance against the copy of B/L or L/C at sight. Our normal delivery time is 2 to 5 weeks. But if your order is some special engine and alternator, the delivery time will be longer.